Ko Hayang Jip Part II - mmm-yoso!!! *** Update: Ko Hayang Jip is now Go Ba Woo, but the menu and the food seems to be the same. We were mulling over heating up our leftovers from our previous night's meal at Ko Hayang Jip, when we decided that it would be to our benefit to gather even more leftovers..... So we found ourselves back at Ko Hayang Jip. We had made mental notes of a few items that we wanted to try, and so placed our order. Being a real Mom-and-Pop operation, the Lady who I'm assuming is the Owner, recognized us immediately. Also, I don't think they get very many non-Korean customers. As with the night before we were given 8 plates of panchan. No lotus root this time; but at least we got the green peppers, I don't know the Korean name for this, but we call it Shishito Peppers. Makes a really good panchan. I also enjoy the potato salad. This version has quite a bit of boiled egg in it; but very creamy and rich tasting. The broth was similar to a slightly beefy and not as spicy jjigae style broth, very velvety in texture, and not as spicy as it looked. A boiled egg, gosari(fiddlehead fern), dangmyeon (sweet potato starch noodles), and a few thin strips of beef stood out. The Missus thoroughly enjoyed Her soup, though she's not a big fan of the Korean style "mixed"(black and short grain) rice that is served here. She even asked for white rice, but was told that they only serve this type of rice here. Also, she was told "it's good for you". This version was served on a hot cast iron plate, with a small portion of bulgogi, mung bean sprouts, shiitake mushrooms, and other vegetables, all topped with a sunny side up egg. We both thought the portion size was quite small, and the overall taste was pretty much on the bland side; I ended up using up the entire dish of Gochujang provided. I much rather have my BiBimBap served in a hot stone bowl which forms a really nice crust; we weren't too impressed with this. Overall, Ko Hayang Jip provides a pretty good alternative to all the other Korean Restaurants in town. The ingredients are fresh, the prices in line, if not a bit more inexpensive, and I also noticed that except for the Mandu, all the dishes were not oily at all. There are some restaurants that are opening up that you can order just rice and panchan, or so I have heard. I know in Korea they have them, but I have not been lucky to find one here. It's too bad you did not get to try the Korean BBQ. Calvin's picture is making me hungry! What did Calvin have to say about the the BBQ? I have to agree that panchan-and-rice would make a great meal. I wonder if I could get away with just ordering a small meat dish... good vegetables and rice make me happy. Hi Rachel - The Missus is the Queen of leftovers, and really does enjoy them - I think that's one of the reasons why she even puts up with my Food Blogging! Hi Kathy - During the summer months I'll buy a bunch of panchan from our local Korean Market and just live on KimChee and rice....so delici-yoso!!! Hi Mills - You got a point....how could it be Dolsot BiBimBap without the stone bowl??? 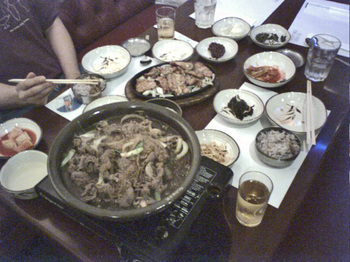 "We got the standard bulgogi, which they cooked at the table on a hot iron griddle and later kept moist with broth. I also got the chicken bulgogi variant, which came on a platter pre-cooked. Both were a tad underflavored compared to Boocho, but tender and yummy." Hi DCCF - Believe me when I say that this blog would only be a shadow of itself without all of the great comments. And you don't know about Miu Miu? Hi Howie - My favorite DolDot BiBimBap is either at Buga or Balboa Tofu House....hmmm, I'll have to go check it out. I'll ask around about places that would serve panchan and rice! Why is everyone eating Korean food lately?! I need to go eat some soft tofu hot pot A.S.A.P. because i've had the longest craving for it. lets just say no one will look at you funny if you're wearing a trucker hat and marlboro. hey kirk. LOL about the leftovers. and the panchan -- me want some! i have yet to be served an authentic dol sot though. yo-so lucky to have all these neat restaurants around you to explore! Hi Christine - I think it's the bit of cold (for SoCal) weather we had lately. Hi DCCF - Ain't going to touch that one! I don't need hate mail from Sam Dimas. Hi Stef - Nice to hear from you! For some reason BiBimBap tastes better in a DolSot. Hi Mills - No problem, it was pretty easy..... So Jo's still dreaming about singing Desperado, huh?